As an HMS, or pear-shaped carabiner, the Pirate easily accommodates the use of a wide range of gear, webbing or ropes--either as a belay biner at the harness, or as a connector in a system. The Pirate's robust 0.5" diameter round frame will endure abuse from dirty ropes and metal connectors far beyond stamped carabiners with thin edges. The Pirate's durability matched with Rock Exotica's build quality ensures an impressive service life for the working professional or recreational enthusiast. 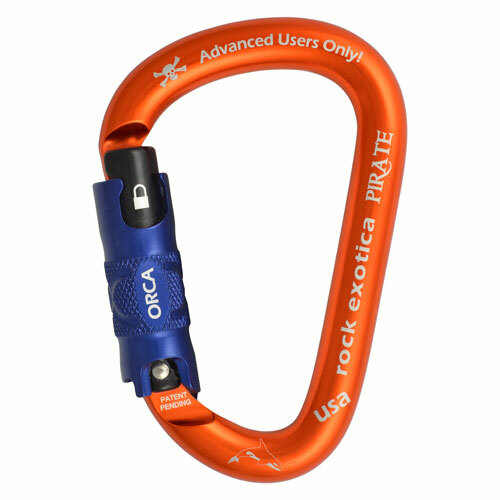 The ORCA is an enhanced 3-stage mechanism available on Pirate, rockD and rockO carabiners. This unique gate system lifts up and twists just like many traditional auto-locks, but can be set to remain in the unlocked position. This allows the gate--whether you attach the ORCA carabiner immediately, or leave it installed in an anchor to connect a line later, to open easily, just like a non-locker. And when it closes, it closes and rotates shut with the safety and surety of a locking carabiner.